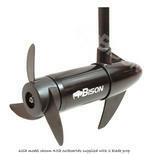 • Durable, reliable and more power for your money. 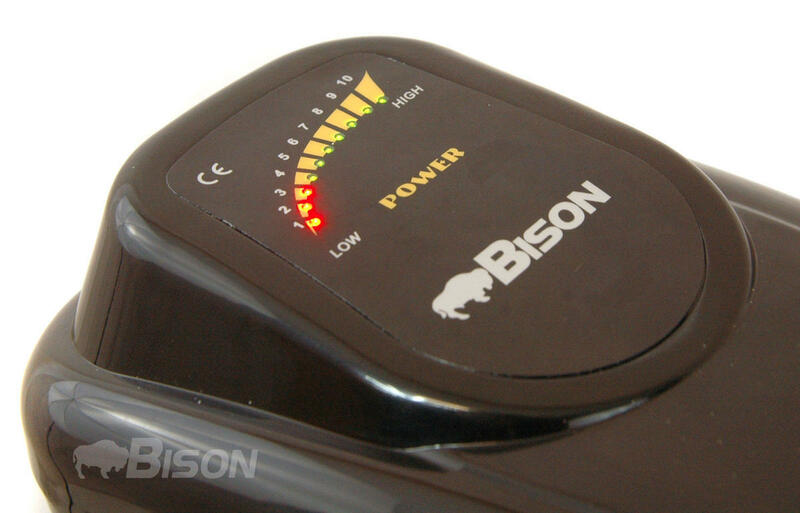 Put one to the test and see why Bison is the best value electric motor on the market. • Designed for Salt and Freshwater use. • Low Noise indestructible Composite shaft stronger than steel, flexes on impact. • Lever Lock Transom Bracket will not break, kink or corrode. Twice as strong as conventional brackets. 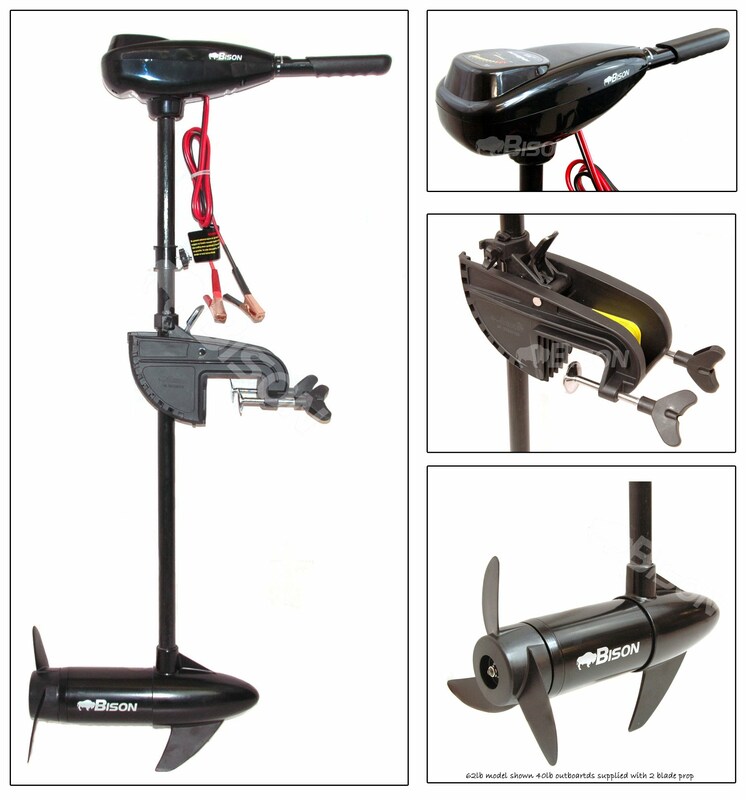 • True weedless power prop. 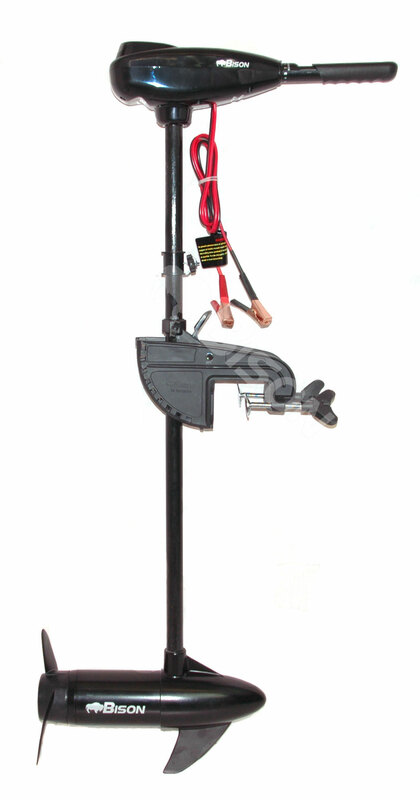 Patented swept back design pushes weeds away without draining valuable power. Power prop delivers extra power for greater acceleration. • UK Service Center. You can be confident that in the very un-likely case that something should go wrong that there is a fully qualified team of technicians here in the UK. 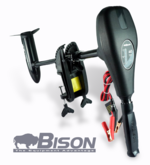 This is the most powerful of all Bison electric motors and requires 24 volt (2 X 12volt batteries) to operate. Designed for Salt and Freshwater use. 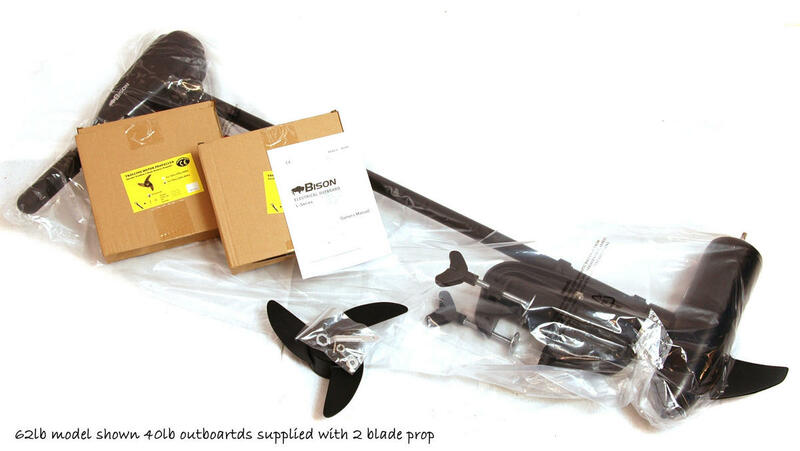 Please not that the 68lb and 100lb motors don't come with crocodile clips attached. • Completely environmentally friendly, no smell, no smoke, no noise . • VERY low noise output makes electric outboards your ideal fishing companion, you can now cruise up on that big fish in virtual silence. • maintenance free makes electric outboards your choice for your next auxiliary engine - no more dirty carburettors, oiled up spark plugs, stale fuel -etc. Size or power of motor? 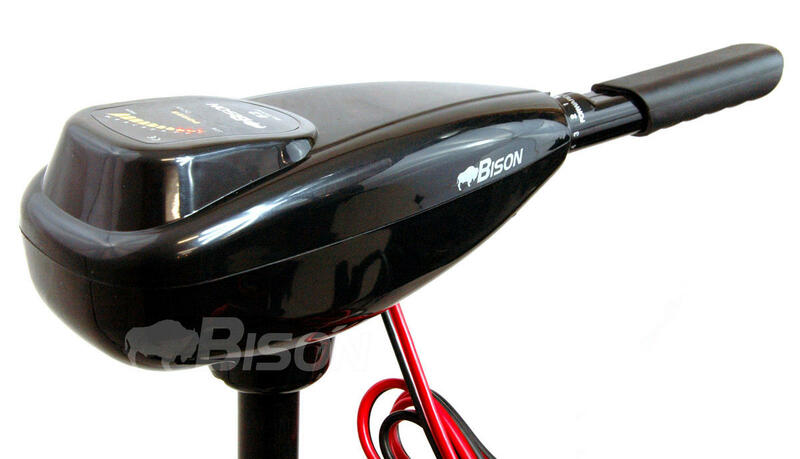 • 18 lb thrust motor is ideal for kayaks,canoes and dinghy to 6' and will move a kayak or canoe at 3 or 4 mph in most conditions. 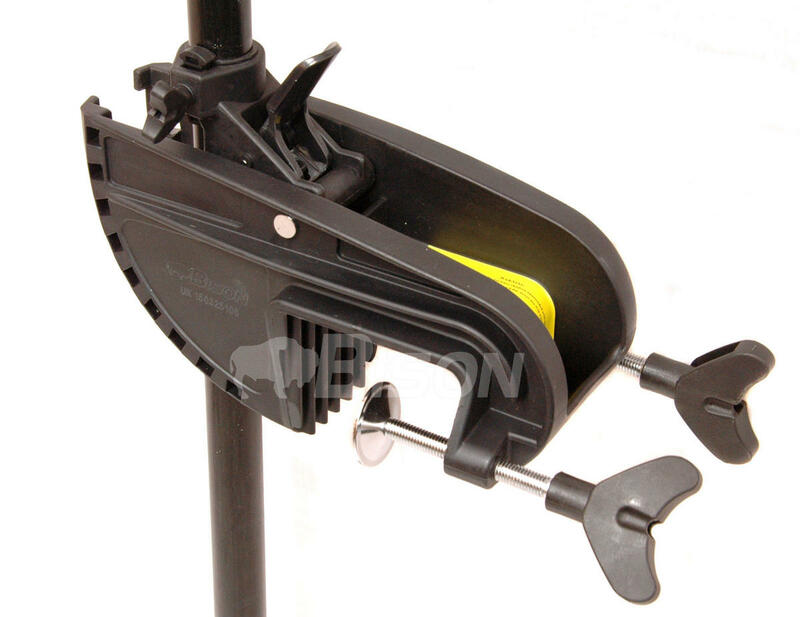 • The 40 ft /lb is ideal for fisherman in boats in sheltered locations and is the a popular motor for fishers it will move most angling type fishing boats at 3 to 4 mph in reasonable conditions. • The 55 ft /lb motor is again a popular choice for anglers and is suitable for larger waters and gives that little bit extra power that can be required if the wind picks up, should move most fishing type boats in the 12 to 16 size at 4 or 5 mph in reasonable conditions. • Bison 68 ft/lb motor is ideal for the larger waters ,sea and larger fishing boats. • 86 ft/lb and 100 ft/lb motors are 24 volt (2x12volt batteries in series) and have a range of commercial uses and can move large boats. To power your electric outboard you will need a DEEP CYCLE battery, also known as a LEISURE battery in our experience 85Ah is an ideal size for most applications. As a rough rule of thumb, to calculate the size of battery you need, just take the max amps draw of your desired motor from the table, and times that by the number of hours you wish to use the motor. Then add 20% so you aren't completely draining your battery every time. 52 + 20% = 63 therefore we would require a 65 Amp Hour battery or larger. Also worth noting is that current consumption at slower speeds is much less, you will draw about a quarter of the charge from your battery at low speed. 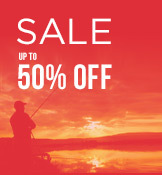 We have sold many thousands of electric motors since we started selling electric trolling motors almost 10 years ago We have our own service center and technician here at Newmill where we repair and service electric outboards and electric fishing reels. 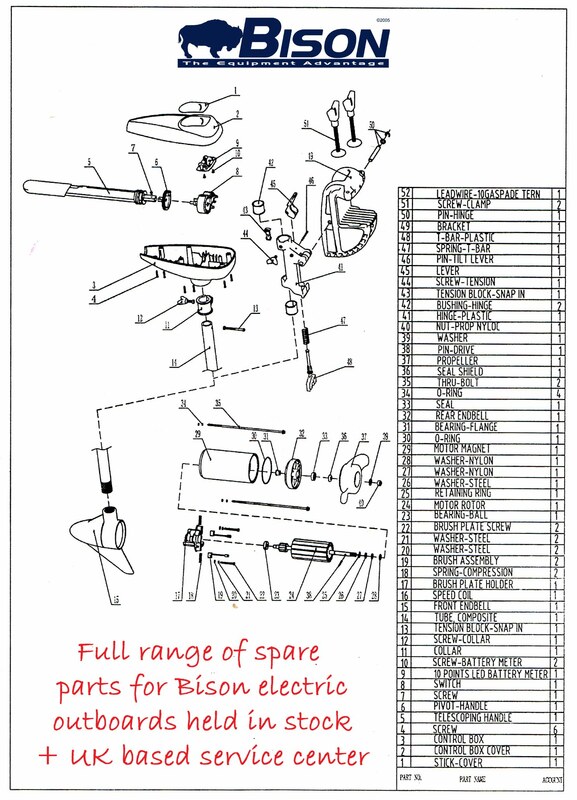 We carry a range of spare parts and our technician will always be happy to give advice on modifications and faults.